The Book of Negroes, a TV adaptation based on Lawrence Hill’s 2007 award-winning book, premiered last Wednesday in Canada (CBC Television). The six-part miniseries will finally air in the U.S. in February. The series tells the story of Aminata Diallo (played by Aunjanue Ellis), a young West African girl taken from her home and sold into slavery in America. Years later, she recounts her tale as the story focuses on abolitionists, the eventual outlawing of the slave trade and the journey some former slaves took back to West Africa. The novel was also published under the title Someone Knows My Name in the United States, Australia, and New Zealand. 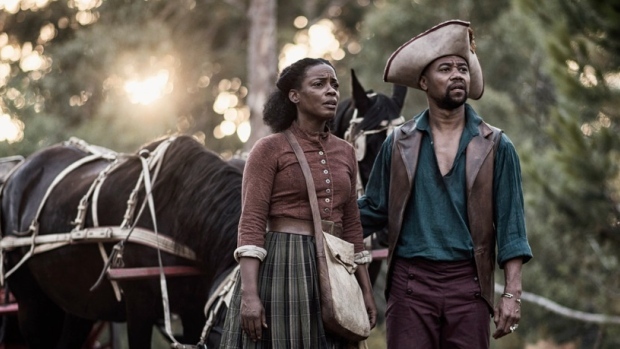 Other stars include Academy Award-winning actors Lou Gossett Jr. and Cuba Gooding Jr. Lou Gossett Jr., plays Daddy Moses, a slave who helped lead a band of runaway slaves to freedom. The novel was named after the actual historical document which recorded the names and descriptions of thousands of Loyalist slaves who were granted their freedom and then traveled on to Nova Scotia, Canada. It sold nearly a million copies worldwide and also won a host of awards, including the Writers’ Trust Fiction Prize and the Commonwealth Writers’ Prize for best overall book. From everything that I’ve heard, it sounds like an amazing story! I can’t believe this is the first time that I’m just hearing of this book. I’m a voracious reader, and usually keep up with what’s new on the Best Seller’s Lists. I’m definitely planning on buying it at some point in the future. Don’t forget to catch the premiere on BET next month!